When we chose the Rick Riordan series as our summer aloud, I never thought we’d still be working through his books some eight months later. But here we are, in the freezing cold throes of winter, still caught up in the struggle between demigods and giants. 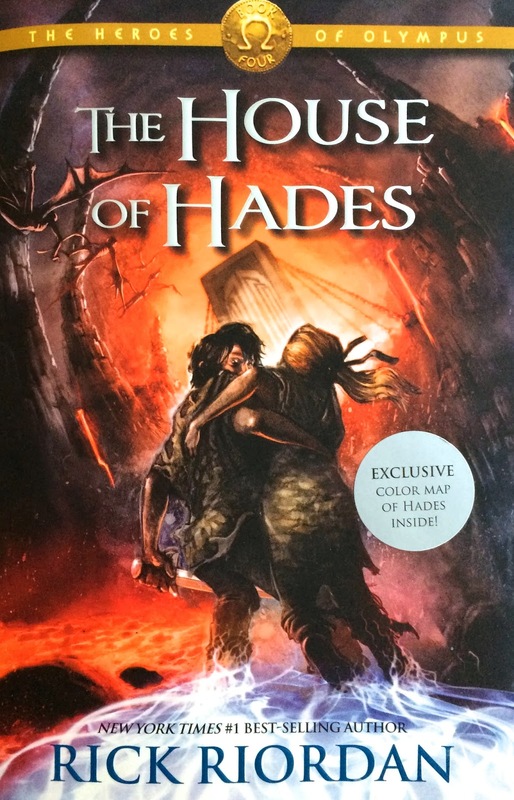 While we’ve enjoyed the entire series, my boys & I agree that our current book, The House of Hades, is more exciting than the previous book, The Mark of Athena. Our least liked character? Piper. She’s a nice girl and all. But being the daughter of Aphrodite means she’s a bit too fixated on boy-girl stuff for us. I admit to feeling a little uncomfortable when I have to read about Piper and her boyfriend, Jason. I push through these parts by hamming it up, reading more dramatically and making my boys giggle even as they wrinkle up their noses and groan about having to hear about how much Piper loves Jason. Would we recommend the Riordan books to others? Yes. Absolutely. But I also think parents should be aware that as the characters grow older in each subsequent book, they find themselves dealing with more and more teen-aged issues. If someone’s 8 year old is plowing through these books on his/her own, one might find oneself having some rather unexpected conversations…. so just be warned. We’ll be finishing “The House of Hades” in another week or so. Then it looks like a long wait til the last book of the series is released. My boys and I are already in discussion over which book to read next. I’m lobbying to slip in a few of my favorite childhood classics. Much as I’ll miss our demigod friends of the past 6 months, I am also looking forward to introducing the boy-os to new characters, stories and authors. It’s such a gorgeous skein of yarn. Cascade Baby Alpaca Chunky. Buttery smooth to the touch. Dramatic black and white colors twisted together. It’s the yarn that has everyone stopping to take a second look at it in the shop. Yet there’s been hesitation about buying this yarn. I understand why. Everyone’s been wondering what it looks like knitted up. Beautiful yarn does not always translate to a pleasing knitted “fabric.” Case in point: variegated yarn. I love the look of that stuff… when it’s just yarn. I hate the randomly blotchy look of it after it’s been knitted up. So no variegated anything for me! What about my new “Penguin” yarn? Nothing to do but knit a swatch of course! Used a basketweave stitch. I chose to alternately knit-4 and purl-4 through each row. Switched order every 6 rows (between starting a row with knit or starting a row with purl). I ended up with a “swatch” (closer to half a scarf) about 28 inches long. 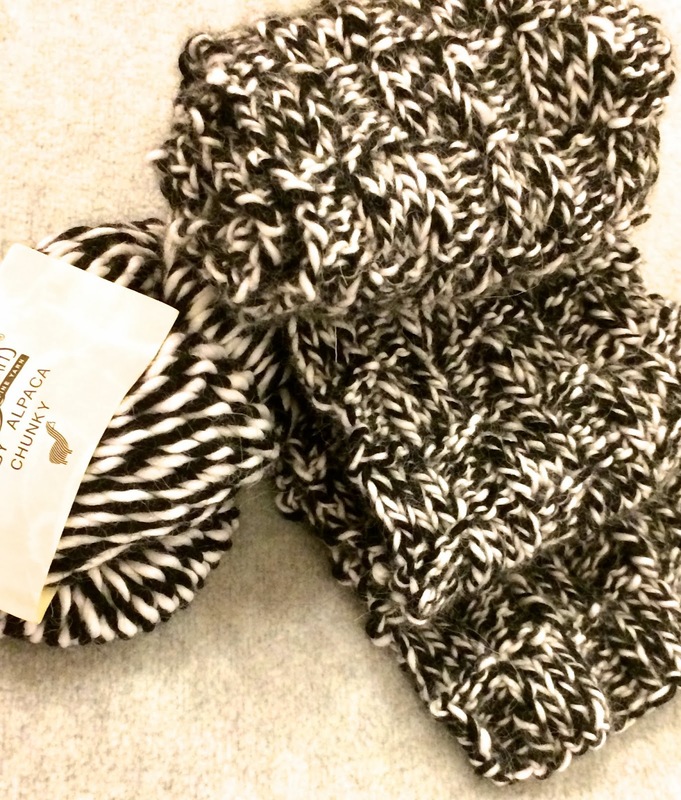 If I wanted to make a modestly sized scarf, I’d add another skein to the project. If I wanted to loop the scarf round and round my neck? Then I’d use closer to 3 skeins. Now that I’ve tested this yarn out, it’s time to see what I can do with the Cascade Eco Duo I have shelved right next to the Baby Alpaca Chunky. Stay tuned! Meditatively mindless. Sometimes I just don’t want to think about what my fingers are doing. Sometimes I prefer plugging my mind into a movie and setting my hands into making mode. 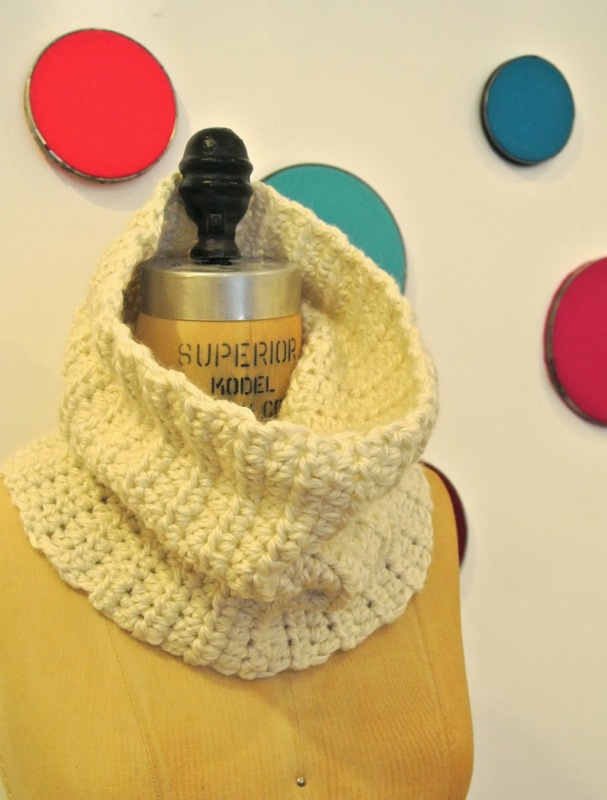 After creating the foundation chain, the only stitch required to form this cowl was half-double crochet. Perfect. Re-made from discarded materials. Thank you to my buddy, Rachanee, for giving me her reject knitting project last year. It took a little time to unwind the yarn, but the pretty, free yarn was worth it! Sharp looking results. Ok, I do make a lot of things by hand… but this doesn’t mean I necessarily like the “homemade” look. I like clean colors, simple lines and functional pieces. This cowl is all three of these things. The instructions for this project comes from Marion Madel’s “The New Crochet.” She has quite a few patterns I’d like to try (although not the giant oven-mitt-mittens). Crochet. It’s really a very cool skill to have. You can keep things simple (as I prefer) or get real fanciful with it. And now, I believe that’s enough talking about crocheting & time to fetch my hooks and a skein of yarn. It’s Sunday night. It’s freezing out. My boy is sitting next to me watching old Star Wars movies… feels like the perfect time to get crocheting!